Opinabilis Annae Bradstreet cogitantis effigies. Saeculum 19. 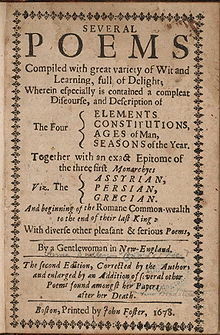 Pagina titularis libri The Tenth Muse Lately Sprung Up in America, Londinii anno 1650 prolati. Pagina titularis editionis alterius poematum, 1678. 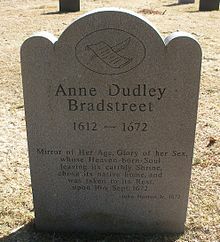 Monumentum Annae Bradstreet in Old North Parish Burial Ground Andover Septentrionalis Massachusettae dicatum. Anne Bradstreet (nata Anne Dudley; circa 1612—16 Septembris 1672) fuit colona Puritana in Nova Anglia habitans, ac primus poeta et prima scriptrix in coloniis Americae Septentrionalis Britannicae qui librum protulit. Suum primum poematum volumen, The Tenth Muse Lately Sprung up in America, anno 1650 prolatum, populo et Mundi Veteris et Mundi Novi bene acceptum est. From "Upon the Burning of Our House July 10th, 1666"
Ex "De nostra domu combusta, 10 Iulii 1666"
quae mea bona nunc in pulvere posuit. Ita, hoc modo fuit, et ergo fuit iusta. Fuit ipsius; mea non fuit. Minime sit ego ut conquerar. Vicicitatio habet citationes quae ad Annam Bradstreet spectant. The Tenth Muse, Lately sprung up in America (1650) and, from the Manuscripts. Meditations Divine and Morall, Letters, and Occasional Poems. Facsimile. 1965. Scholars' Facsimiles & Reprints. ISBN 978-0-8201-1006-6. ↑ Heidi Nichols, Anne Bradstreet (Phillipsburg Novae Caesareae: P&R Publishing, 2006, ISBN 9780875526102). ↑ 3.0 3.1 3.2 3.3 3.4 3.5 3.6 3.7 3.8 William Addams Reitwiesner Genealogical Services. ↑ 4.0 4.1 4.2 4.3 4.4 4.5 4.6 New England Ancestors. ↑ “Jewett belonged to a succession of women writers, mostly New Englanders, that went back through Harriet Beecher Stowe and Rose Terry Cooke to colonial poet Anne Bradstreet—who, according to some accounts, was yet another of Jewett’s illustrious ancestors.” Paula Blachard. Sarah Orne Jewett: Her World and Her Work (Reading, Mass. : Addison-Wesley Pub. Co., c1994), 356–357. Cook, Faith. 2010. Anne Bradstreet: Pilgrim and Poet. Darlington: EP Books. ISBN 978-0-85234-714-0. Gordon, Charlotte. 2005. Mistress Bradstreet: The Untold Life of America's First Poet. Novi Eboraci: Little, Brown. ISBN 0-316-16904-8. Nichols, Heidi. 2006. 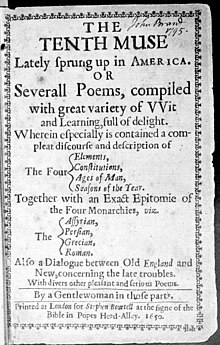 Anne Bradstreet: A Guided Tour of the Life and Thought of a Puritan Poet. Phillipsburg Novae Caesareae: P&R Publishing. ISBN 9780875526102. Novissima mutatio die 17 Iulii 2017 hora 13:20 facta.